Serving Northwest Wisconsin since 1927. 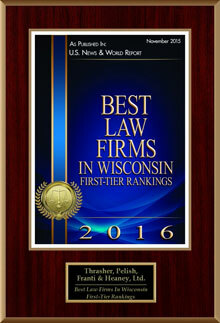 Thrasher, Pelish & Heaney, Ltd. is a litigation oriented law firm in Rice Lake, WI, serving a large geographic area of Northern, Northwest and West-central Wisconsin. We provide legal services in litigated matters involving insurance issues, personal injury and workers’ compensation, business and real estate. We handle civil appeals in all of our areas of practice, including referrals. Our lawyers have a broad range of experience. Current members of the firm have conducted civil jury trials in 28 Wisconsin counties. These range from relatively simple one-day trials to complex personal injury or professional malpractice cases lasting several weeks.